At its recent iConnectSolutions user conference, NEWSCYCLE Solutions selected GoErie.com as the winner of its 2016 Innovator of the Year Award. The annual Innovator of the Year Awards honor a media company using Newscycle software to create impactful programs that make a measurable impact on growth and new digital revenues. GoErie.com received the 2016 award for its GoErie.com Paywall initiative. With the paywall in place, GoErie.com experienced a 145% increase in revenue from new 2015-2016 digital subscribers over new subscriptions in 2014-2015. The GoErie.com team used Newscycle Digital CMS templates and scripts, integrated an Application Program Interface from Syncronex, which powers Newscycle’s Digital Paymeter system. The inline paywall was designed to increase revenue from new digital subscribers and all-access print subscriptions, expand analytics and reporting capabilities, and improve the overall user experience. 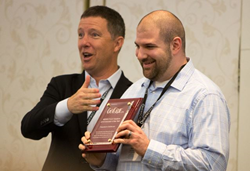 The award was presented to GoErie.com by Newscycle CEO Preston McKenzie at Newscycle’s annual user group conference held last week in Bloomington, Minnesota. Ben Smith, the Webmaster at Erie Times-News, received the award on behalf of the Erie Times-News Audience Development team, and CyberInk, a digital agency backed by GoErie.com based in Erie, Pennsylvania. Newscycle develops and delivers software technology that empowers the global news media industry. Our solutions enable publishers to thrive in a rapidly transforming market. We help our clients in their mission to create stronger, better informed communities, while protecting the integrity of news, advertising and customer information. Newscycle is a trusted partner serving more than 750 media enterprises, including 1,200 companies with 8,000 properties across 45 countries on six continents. The company is headquartered in Bloomington, MN and has U.S. offices in Florida, Michigan and Utah; with international offices in Denmark, Germany, Malaysia, Sweden, and the United Kingdom; and satellite offices in Australia, Canada and Norway. For more information about Newscycle’s technology innovations for 2016, go to: newscycle.com/innovations2016.